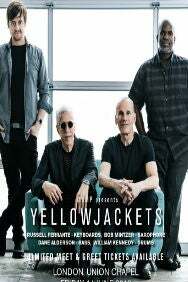 We do not curently have theatre tickets available for YellowJackets. This could be because we have simply sold out or it could be that this show is no longer running. The information on this page remains purely for historical and informational purposes. Originally starting out as the backing group for Robben Ford's 1977 album "The Inside Story", the band continued after accepting a deal with Warner Brothers which culminated in their 1981 self-titled debut album. Having now released a further 20+ albums, Yellowjackets are one of the world's most popular and recognisable Jazz groups. Over the years there have been many collaborators and members of Yellowjackets such as Jimmy Haslip, Paulinho Da Costa, Ricky Lawson, Marc Russo, Kurt Elling, Brenda Russell, Jonathan Butler, Peter Erskine, Terri Lyne Carrington, Felix Pastorius, Bruce Hornsby, Randy Crawford, Bobby Caldwell, Alex Acuña, Ambrose Akinmusire and more. Their latest album "Raising Our Voice" is out now and features guest vocalist Luciana Souza.